Deco Art Lush Foliage Crafter's Acrylic Paint - DECO ART-Crafters Acrylic All Purpose Paint. 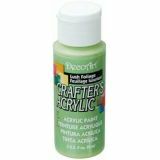 Crafter's Acrylic is a low-cost acrylic paint for simple base-coating and craft projects. Designed to brush out smoothly and evenly, it covers in 1 or 2 coats. Crafter's Acrylic is versatile and can be used in general arts and crafts, stenciling, ceramics, school projects, home decorating and decorative painting. These paints can be used on wood, paper mache, fabric, plaster, clay pots, ceramic bisque, candles, canvas, resins, polymer clay, styrofoam, poster board, paper, tin, cads, gift bags and much more. All colors are intermixable, fast drying, non-toxic and simple soap and water clean-up. This package contains one 2oz/59ml bottle. Available in a vast variety of colors: each sold separately. 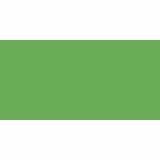 Paint conforms to ASTM D4236. Made in USA.